Among the most significant figurative painters of the 20th century, Francis Bacon (British, 1909-1992) gave form to the emotional and psychological landscape of the modern era. Both acclaimed and reviled during his lifetime, the Dublin-born Bacon touched the raw nerve of the post-war era in his art historically referenced paintings and existentially wrought portraits. The fourth installment of the Museum’s ongoing series MASTERWORKS I Portland, Bacon’s magisterial Three Studies of Lucian Freud (1969) is considered to be among his finest portraits for its aesthetic resolution and insightful rendering of fellow artist Lucian Freud, the grandson of Sigmund Freud. 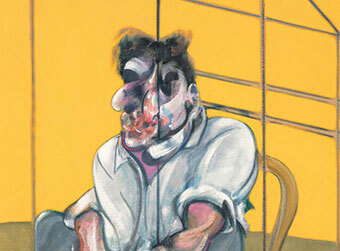 Bacon and the younger Freud were introduced to each other by painter Graham Sutherland in 1945, and would become close friends and regular companions in post-war London. As they shared each other’s emotional trials and tribulations, their friendship provided a challenging aesthetic sounding board for their painterly exploration of figural expressionism. They painted each other on numerous occasions; Bacon realized more than a dozen different portraits of Freud during his lifetime. Three Studies of Lucian Freud is considered a triumphal emotional and painterly summation of their friendship at its apex. Audaciously setting his portrait against a vibrant yellow ground, Bacon frames his friend and rival inside a crystalline space frame that defines an emotional as well as architectural space. Shifting viewpoints from left side to face to right side across the three panels, the artist renders his subject as a tightly coiled mass of energy, ready to spring from the caned bentwood chair positioned in front of a brass bedstead. The expressive, volatile brushwork that delineates the hands and face acts as a brilliant foil to the smooth rendering of the highly abstracted objects and space. First shown in Italy and subsequently in Bacon’s triumphant retrospective at the Grand Palais, Paris, in 1971-72, the Freud triptych was separated and sold into three different private collections. It disappeared from view for more than 15 years before being reunited by an Italian collector in the 1990s. With this exhibition, this magnificent work reenters public view for a limited time. Don’t miss the once-in-alifetime opportunity to view Three Studies of Lucian Freud. Organized by the Portland Art Museum and curated by Bruce Guenther, chief curator and The Robert and Mercedes Eichholz Curator of Modern and Contemporary Art. This special installation is made possible in part through the support of the Paul G. Allen Family Foundation.